Our ReCycle Program is run by a subcommittee of Music City Trykes (MCT) members. The chair of the committee serves as a liaison between community therapists, families and the chapter. The committee helps coordinate volunteers to assist with Amtryke pickup, cleanup, preparation and fitting the next rider. Upon receiving any Amtryke from MCT, families are provided info on the ReCycle Program, and every tryke receives a commercial grade sticker to remind families to contact MCT when they are done with it. When they are ready, families reach out to the chapter via email, phone, through their therapist, or social media. The committee helps coordinate pickup. We then multiply the depreciated value by a percentage factor based on the tryke’s condition to determine the family’s ReCycle credit. When the credit is determined, families then have the option to raise the difference in the cost of a new Amtryke and the ReCycle credit or to be added to our chapter Wish List for funding support. We use the ReCycle credit as an incentive to encourage good maintenance and overall care of the trykes. With a consistent 60-70 rider Wish List, it is our hope that an Amtryke that is not ridden (for any reason) is never left to collect dust or rust rather than being put to use! Once we’ve secured the Amtryke (or scheduled a pick-up), the chapter secretary then determines who is next up on the Wish List in need of that particular frame. We then confirm the family’s interest in a ReCycle versus waiting for a brand new Amtryke. Next, a list of parts and accessories needed for the next rider is compiled and ordered. In the interim, the recycled tryke receives a heavy dose of elbow grease to bring back that bright red and chrome shine. Most of the time, the Amtrykes look so good when fully refurbished that people assume they are brand new. 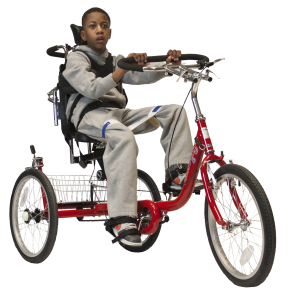 In the event that a tryke comes back to us in poor shape, we “scrap it” for usable parts to be put to use by our “fleet” in action and those that are yet to be given out. 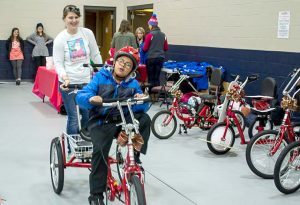 When the needed adaptive accessories are added or changed out, and the safety check is complete, a therapist chapter member or therapist volunteer meets up with the family to do a fitting. If one of our large giveaway events is coming up, we will often do the fitting there. This process has evolved over the years and we have faced some challenges. ReCycled Amtrykes “in waiting” have to be stored somewhere in the transitional period between riders. For us, that has meant the trunk of a car, a warehouse, a closet, a workplace, and even a chapter member’s kitchen! When families cannot transport a tryke, chapter members have to go pick them up. Initially, the requests to ReCycle trickled in. However, we now have a steady stream, averaging with 2-4 per month. These calls and emails do not always occur in the weeks before a large giveaway event (which would be the most convenient). What this means is more individual fittings for new riders and lots of logistics gymnastics. This can be a drain on chapter members so we do our best to spread the love and request new volunteers for these duties each month. The most exciting development within our ReCycle program is yet to come! This summer, we will hold our first ReCycle Roundup! Families and volunteers will be invited to bring pending ReCycles to us at a park or school. 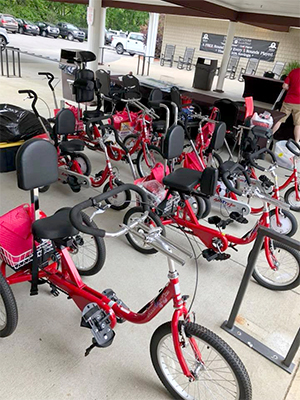 If needed, trained therapist evaluators will assess each current rider for his or her new Amtryke while other volunteers assist families with a tryke wash and tune up. The ReCycle committee will then assess the bike and determine needed repairs or guide volunteers for scrapping parts. If the condition of the incoming Amtryke is known to be excellent, and it fits the needs of a child on the Wish List, it will roll right back out that day with a new rider. This will allow our current riders and their families to come full circle and serve as the “next link” in the Amtryke chain. Once the available ReCycles are rounded up, it will be much easier to determine what to order to accessorize the trykes specifically or the next riders at the upcoming large giveaway event. 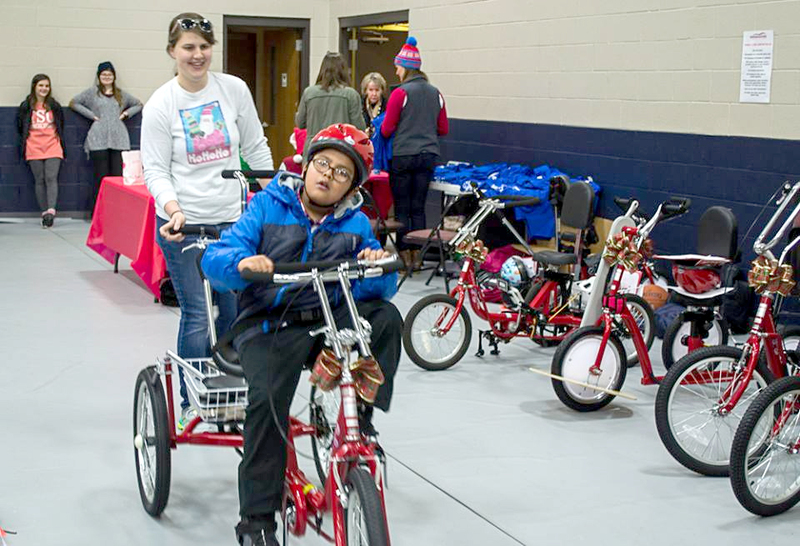 Since its official start in 2016, the MCT ReCycle Program has brought a refreshened set of wheels to more than 20 children on our Wish List. A handful of our riders are on his or her third Amtryke, and a handful of our Amtrykes have had three different riders! We love telling our sponsors about this program. To us, it means more kids riding with shorter wait times and less funds to be raised. To them, it means their donated dollars go further. In the land of charitable causes, “sustainability” can be a major selling point for potential and return donors. We know that there are no two identical AMBUCS chapters or Amtryke programs. However, we hope you’ll be able to take a few ideas from this post to start or strengthen your ReCycle program. Best of luck and shoulders together!